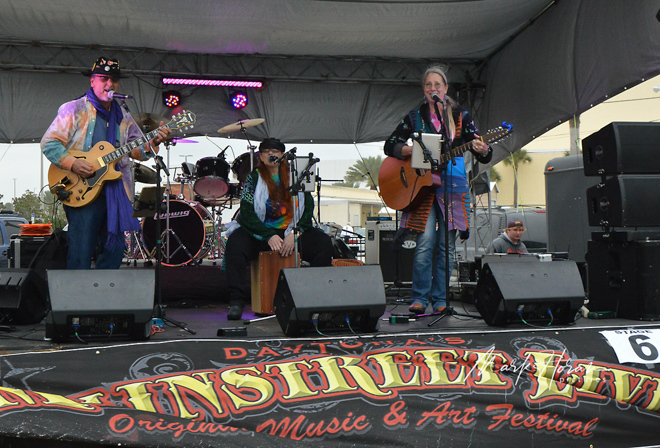 Daytona Beach, Florida was the site of Main Street Live Original Music and Arts Festival on February 9, 2019. MNPR Magazine was on the scene with Mark Horan of MarkHoran.Pictures LLC, their Florida correspondent. The festival aligned Main Street starting at The Boot Hill Saloon, stretching a mile and terminating a block from the sands of the Atlantic Ocean. Stages for original music with art exhibits in the street in between. A light rain off the ocean came and went throughout the day but not hard enough to dissuade the musicians or the music fans in attendance. All 19 stages performed simultaneously to accommodate over 130 acts in this 1-day event. Shelter from the weather could be sought inside any of the 5 indoor stages along the route. Turnout was lighter than previous Songwriters Showcase of America events in the past due to the weather. The day started at 2pm with the festival getting in full gear around 5pm. Having attended three previous SSA evens, I was looking for the artists that I have supported over the years and what times and what stages they would be performing on. I started at stage 3, the premier stage inside “The Bank and Blues Club.” A quartet from Ormand Beach, Florida called the “Val Louis Band” was on the corner stage of this cozy venue complete with a balcony for bird’s eye pictures. They played rock, funk, and blue-eyed soul. Their set lasted thirty minutes. I then ventured into a light rain to stage 1 across the street in the parking lot of Full Moon Saloon. On stage was “The Ned” a Rugrat punk band from Palm Coast, Florida. The four young men’s set had energy and hard-hitting rock and roll that your mother warned you about. They were engaging and really enjoyed performing for the crowd. “Kelly Neff,” a singer songwriter from St Petersburg, Florida was on stage 3 when I returned to The Bank and Blues Club. She performed solo with and acoustic guitar on the corner stage. Kelly is an accomplished songwriter and I always enjoy seeing her rock and roll performances. Staying inside at The Bank and Blues Club where it remained dry was a band that I am very familiar with, The “Melissa Crispo band”. I have been following this band for the past sixteen years and just last week my camera was invited into the recording studio as Melissa finished the tracks on her new LP. The new LP is due to be released on March 23, 2019, a week before the band boards the ship to perform for seven days on The Melissa Etheridge Cruise. 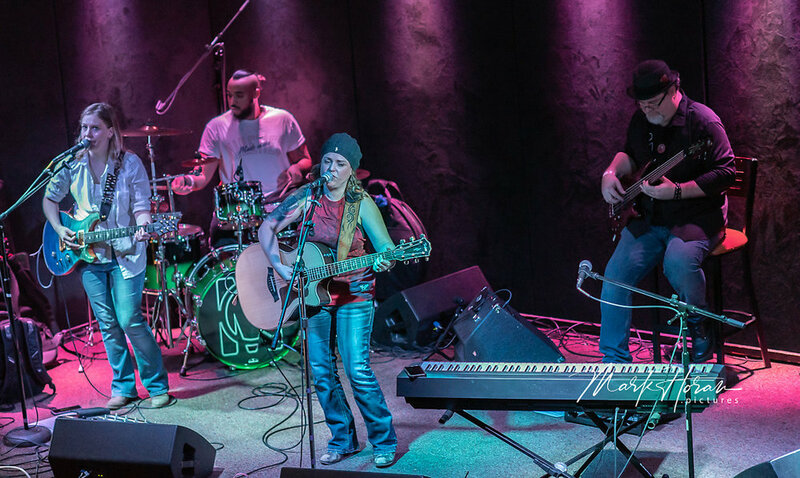 The Melissa Crispo Band is from Orlando, Florida and plays pop and rock. 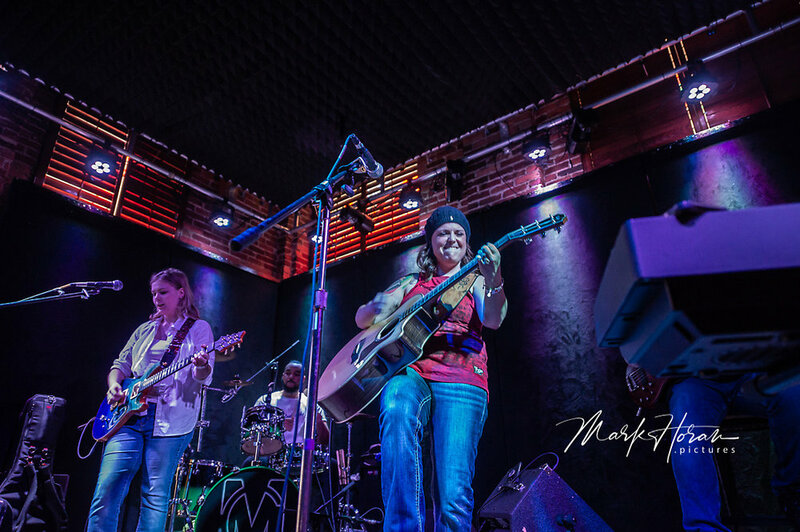 Melissa won the Songwriters Showcase of America song of the year in 2017 with “Take Back Your Power.” Check it out on iTunes! The next two hours I bounced outside from stage to stage as the rain subsided. There was such an array of acts, from solo bass players to full bands playing soul and funk. Not every band could be written up and I apologize to those performers. I included a montage of pictures to get the feel of the “vibe” in the streets of Daytona Beach. Getting back on schedule and to the outside stage 14 in front of “Main Street Station,” was “The Wait” a band I covered last year for MNPRmagazine.com. The Wait is a five-piece rock band originally from Boston, Massachusetts that relocated to Orlando, Florida in the 1980’s. They have just released a new single "Stay In Love.” I always enjoy the energy of their shows and I will be seeing them again soon. I finished the festival with 2017 Songwriters Showcase of America’s band and musician of the year. The band from Debary Florida, “Grindstone Sinners”. The Sinners play rhythm and blues and classic rock with a tie died flair. On stage 6 in the parking lot of “Dirty Harry’s Pub” at 8:15pm and finishing out the outdoor stages on stage 10 a block from the ocean. Their two shows were completely different, the first a typical stage performance, and the last show there was dancing in the street as the band took requests from the crowd. A perfect ending to a long day. This band of schoolmates gets better every time I see them. Check them out on YouTube and see for yourself. This festival was completely original music from artists in Central Florida. These are the next new artists you will might be hearing on your local radio stations! Get out and support your local musicians and the local music scene where ever you are. They really appreciate it!